Why are we giving you a free copy? Thank you for using Quick Heal Mobile Security. As a part of our consistent efforts to make the digital world free of viruses and give basic security to Smartphones, we have decided to make Quick Heal Mobile Security for Android App Free for all the users. Now, anybody having an Android Smartphone can use Quick Heal Mobile Security app free of cost and get protected. Free Upgrade in just 4 simple steps! What additional benefits do I get while opting for FREE upgrade? If you have a 1 year Quick Heal Mobile Security license, you get a Quick Heal Total Security for Android copy that is valid for 1 year and 6 months (18 months) from the date of your upgrade. You also get free tech support and regular virus definition updates. Why Quick Heal Total Security for Android? Quick Heal Total Security gives your android smartphone comprehensive protection against the latest mobile viruses and internet-based attacks. It also helps monitor and control your android devices, take backup of your pictures, calendar events, contacts etc., and even trace your smartphone incase it's lost or stolen. The app has a 4.5 rating in Google Play. You will get an email with a link to download the app on the registered email ID**. Download the app and register it to receive free support and regular updates. **Registered email ID refers to the email ID entered during registration of Quick Heal Mobile Security. 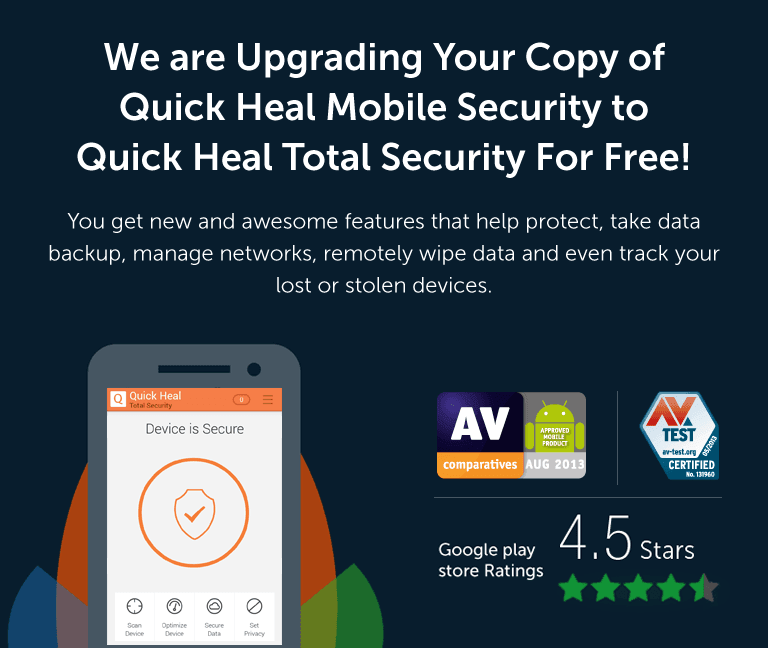 Note: Once you receive the new product key, please uninstall your copy of Quick Heal Mobile Security from your device in order to install and use Quick Heal Total Security for Android. Get in touch with our Support Team for any queries or call us on 0-927-22-33-000. We will be happy to assist!